Politicians do not know when to let go. Their best days might be behind them, their opportunities for future office slim. But like boxers who think that their next bout might result in a favourable result, they do not give up, calling on the old contacts to be able to get press coverage. 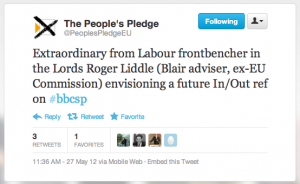 That was the case three weeks ago when Peter Mandelson first called for an in-out referendum on the UK’s membership of the EU, calls that today have apparently been echoed by Roger Liddle (see screenshot to the right). The problem is that both of these gentlemen are letting down those of us in a newer generation of EU-favourable people who are trying to make their way in party politics. While on the EU-critical side organisations such as UKIP and Open Europe gain both in communication ability and organisational strength, on the EU-favourable side we have people like Mandelson and Liddle who both concede the argument about a referendum and also simultaneously fail to see that unless they help build up their own side organisationally, such an in-out referendum would be destined to be lost. It is highly unlikely that either Liddle or Mandelson would play a central role in any future Yes campaign anyway. Mandelson’s prince of darkness qualities mean he is not the right person to put forward if you want to build public support for something. Further, for both of these members of the House of Lords with their positions secure for life, and their pensions from Parliament and the EU assuring them of a cushy retirement in a Tuscan villa, they can look on as British politics tears itself apart on an EU question knowing that at a personal level it is not going to impact them at all. That’s not the same as for those of us whose professional lives in the future are going to depend on whether the UK is in the EU or not. So Liddle, Mandelson, and indeed any other grandees who are favourable towards Britain’s membership of the EU: before you open your mouths about a referendum, think about the consequences. Pour your knowledge and your financial resources into building grassroots campaigning organisations, and building up other people to appear on television and radio rather than your good selves. Because just sounding off and reliving your old glories on TV is the height of irresponsibility, even if you don’t know it yet.